This is a Swiss origin breakfast cereal which has become very famous In US & Euro. It is very high in it's nutritional values & is eaten with milk, yoghurt & if desired topped with fresh fruit. Put the mixture on a slightly oil baking tray. Bake for approx 1/2 hour or until your Muesli turns light brown. 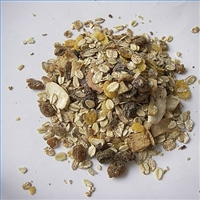 Make sure to turn the Muesli once or twice so that all the oats take a brown color. Take it out of the heat & allow it to cool. Put the muesli in air tight jars & use when ever needed. Just a reminder if u r adding dried fruits then it should be done after the Muesli is out of the oven & has cooled down. Thanks Rabz for posting this recipe.Hope this will be like by all here.Bye!.